Flocks of Carnaby’s Black-Cockatoos winging their way to their evening roost sites has been a familiar sight around Perth for decades. Their days are numbered! 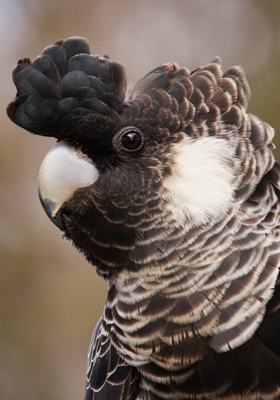 Updated research from BirdLife Australia shows that flocks are getting smaller as the population of these large, white-tailed, black-cockatoos declines each year. 600 people took part in Birdlife Australia’s Great Cocky Count, earlier this year, but the minimum number of Carnaby’s Black-Cockatoos recorded in the Greater Perth–Peel Region was 5518 birds, continuing the drop in numbers from previous years’ counts. Records have shown a significant, ongoing decline in their population, a reduction in flock size as well as fewer occupied roost sites around Perth. This is not an evolutionary trend, due to climate change or other environmental trends, but deliberate habitat destruction! “Perth suburbs continue to expand into the bushland that traditionally supported black-cockatoos. So the black-cockatoos moved into the pine plantations for food and shelter, but now these plantations are being cleared and not replaced.” Thanks mainly to ridiculously high immigration levels, the human population continue to swell, and the deadly threat of urban sprawl spreads like the metastasis of cancer! Perth’s deadly urban sprawl is heating up the metropolitan area and driving out native animal species, according to an Environmental Protection Authority report. The EPA said species that were present at the time of settlement had disappeared from the region, including 12 mammals such as the numbat, while 46 bird species were in decline and many plants were threatened with extinction. Between 2001 and 2009, some 6,812 hectares of natural bush were cleared within the Perth metropolitan region alone. Perth’s human population grew by 2.5 per cent in the 12 months to June 2014 – an extra 48,400 people – with 2.02 million people now calling Greater Perth home. New plans mapping out locations to develop 800,000 new homes in Perth and Peel to accommodate for a future population of 3.5 million have been released by the WA Government. The cost of “progress” ignores the environmental costs, and the loss to native species! Perth’s urban sprawl could be stopped if some of the city’s open space including parks and gardens – is sacrificed for housing! There’s never the option of slowing down our population growth! The pressure is to make the city “more compact”. The Carnaby’s black cockatoo is one of only two species of white-tailed black cockatoo in the world. The other is the Baudin’s black cockatoo. Both are unique to Southwest Australia. Half of Perth’s bird species have suffered declines since European settlement. Department of Parks and Wildlife senior wildlife officer Rick Dawson said at the time that 85 Carnaby’s Cockatoos had been killed on the road in eight weeks – a major blow for a species that’s declined from a wild population of 150,000 to between 20,000 and 60,0000 in 30 years. Black Cockatoos are just another victim of ongoing human greed for economic growth, capitalistic growth, a Colonial frontier mentality, over-population destroying Nature and adding more species to our threatened/extinct list! Australia already has the worst rate of native animal extinctions in the world and allowing this cockatoo species to possibly go extinct and add to that already appalling record because of increasing urban sprawl cannot be allowed. 1) start from the city centre, working outwards, replacing exisiting low density housing (not open space) with high density housing . i.e. build up, not out. 2) fill up all the empty rentals in Perth – 50% are empty! Stop buying investment properties for them to remain empty. 3) Have BIGGER blocks the further away from the city (not smaller). That way, the land does not have to be cleared. And bigger blocks encourage resident to plant more trees. Who wants a massive tree on their 300 sqm block? More urban trees = shade, serenity, beauty, wildlife. 4) Light rail, light rail, light rail – for exports to the coast. Not Roe highway. Less imprint. More capacity. Forward thinking. Please! 5) UWA – save Beelier wetlands. 6) Neerabup industrial area. Go somewhere else. Somewhere already cleared. You won’t have to go far! FINALLY. Just stop it! Stop clearing. Take a breath and plan properly. Increasing the amount of houses does NOT have to be done yesterday. Especially at the expense of our local ecosystems, which will never come back. This is it. This is our future. I meant to say, UWA don’t clear Underwood Avenue Bushland. What is there to not understand that the recovery plan for Carnaby’s is not working and that the decline continues on the same dreadful trajectory? We have to stop clearing native vegetation and the pines in Gnangara. We already have a massive extinction rate, and we can’t expect people to experience a “better life” while more and more people are crammed into existing cities. Destructive urban sprawl can’t be avoided under the “big Australia” model, of endless population growth! We share our land with mega-diversity, that needs higher levels of protection – not just mowed under for economic benefits from housing!